When Terran Scout David Rice climbs from the wreckage of his starship’s escape pod, he finds himself transported from the space age to the steam age in the blink of an eye. Drawn to the sounds of fighting, David immediately throws himself into a desperate battle against overwhelming odds to save the life of a beautiful young princess. Now, marooned without hope of rescue, David is swept into a world of steam-powered airships, treacherous pirates, brutal savages, bloodthirsty monsters, royal machinations, and plots within plots, where matters of strength and honor are most often settled with the clash of swords. As he struggles to learn the strange ways of this new world and who he can trust, one thing becomes clear to him: he must put aside his growing feelings for Her Highness and do everything in his power to return her to her family, even though this means giving her up to the prince she’s pledged to marry. Told in a relentlessly fast-paced and breathless style, SCOUT’S HONOR is an exciting modern homage to the classic tales of planetary romance made famous by writers such as Edgar Rice Burroughs and Leigh Brackett, as well as the cliffhanger-driven energy of the early science fiction movie serials. If you like your heroes unabashedly heroic, your heroines feisty and true, and your plots filled with dangers, twists, turns, and double-crosses upon triple-crosses, you’ll enjoy SCOUT’S HONOR. Entertaining and attention-holding. The short chapters are part of the charm, in the old Perils of Pauline style. This is a book to read for fun, not if you're looking for great philosophical or scientific pseudo-truths. Like books used to be. BTW, the author could easily made the book twice as long by using the obscure and circuitous language popular with writers today, and by adding useless padding. But the author is, as he says, a story-teller, and this is in the classical style of story-tellers from time immemorial. Waiting eagerly for Scout's Oath. Actually wanted to mark it down a half star because I couldn't find the beautiful princess on the cover, but we'll let that pass. De gustibus and all that. Reading this I got a feeling that Henry had watched a few too many black and white serials when growing up. Every chapter ended with a new crisis or moment of near catastrophe. This story was very fast paced and really lacked quiet interludes to bring down the tension. However, the story succeeded despite the strange plotting. The characters while not super deep are engaging and interesting. The writing is very smooth, and the story comes to a rather satisfying conclusion. I can't quite give it 5 stars due to the way the plot never presents a break in the action. It makes sense in the end, but the lack of any real pauses between the multiple crises that populate the story brought it down just a bit. I really liked this book. The action was exciting and fast paced without being too violent and the hero of the book has a strong sense of ethics. It's refreshing to read about a protagonist who really acts like a good role model without being a wimp and a story that isn't depressingly dark. The princess he rescues is not only beautiful, but also a capable person in her own right. 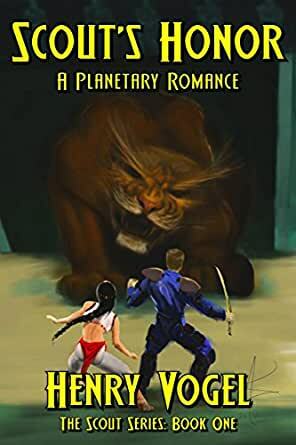 While there is a romantic angle here (Spoiler: the hero gets the girl), it's clean and doesn't get in the way of a fine space opera in the tradition of Flash Gordon. It's not deep, but it is a fun read. I will definitely want to read the sequel. Having enjoyed the author's past work with comics, I was quite eager to see how Scout's Honor would compare... and was extremely pleased with the result. Very crisp and well-paced, I can understand and agree with the comparisons to Burroughs and Brackett. I'll go out on a limb and take it one step further... I could extend the comparison to E. E. "Doc" Smith and the Lensman series as well (one of my all-time favorites). The episodic nature of the writing, while certainly not a new approach, is extremely well done and is very effective even in this day and age. I look forward to seeing Vogel's other works published soon. Highly recommended! 5,0 van 5 sterrenI want to write a book!!! Great. You beat me to it. But you did it in a great and fun way! I loved the pacing, the characters may seem simple. But sometimes, you want your heroes good and your villains to be villains! I did read all the books of John Carter of Mars and explored the red sands of Mars when I was young. Thank you for reminding me that those stories can still be retold and re-imagined. Now a part of me is feeling the inspiration to write something, anything! Thanks! For any other potential readers looking at the reviews. Get the book. It's fun, it's joy and it's just plain adventure! Like I've told others: You write. I WILL buy again.